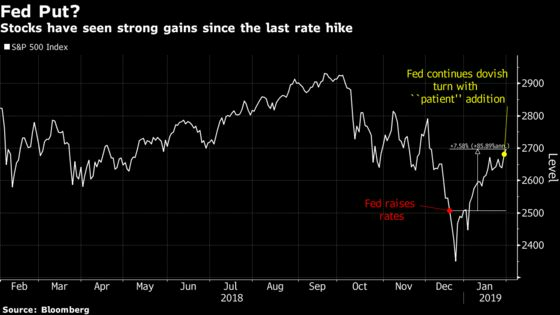 (Bloomberg) -- Deciphering whether the Federal Reserve is pausing rate hikes or calling them off completely is a trillion-dollar question for equity investors, history shows. First, a scenario in which the break is just a breather -- say, five months between increases. On average, the S&P 500 slips by about half a percentage point in the month right after the final bump, according to Ned Davis Research. Then the performance typically flips to a gain of about 1 percent both three and six months out, the firm found. With the S&P 500 up 5 percent in the month after the last rate hike on December 19 -- and even more since then, heading for the strongest January jump in 30 years -- that post-pause gain is easily the strongest on record, in part due to the extent of the losses in December. 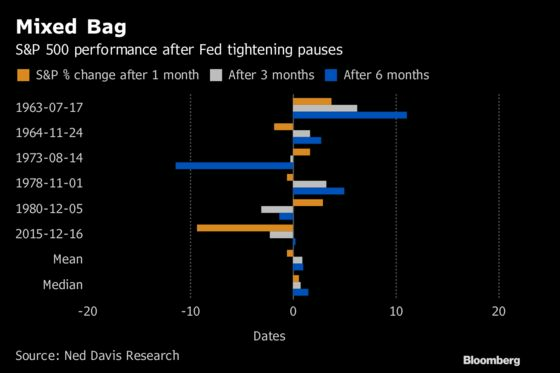 “The month leading up to the latest hike was the weakest on record before a pause, so recent strength could be interpreted as a bounce from a deeply oversold condition aided by Fed policy,” Ed Clissold, chief U.S. strategist at Ned Davis Research, wrote in a note. The Fed added the word “patient” to its statement Wednesday and also signaled flexibility on its balance sheet normalization process. On top of that, the central bank hinted its next move on rates could go either which way, sending rate-hike expectations sliding and stocks climbing. The S&P 500 surged 1.6 percent Wednesday, the first post-meeting gain since Jerome Powell became chair. The benchmark extended gains Thursday. Bloomberg Economics maintains the view that we’re currently in a “multi-quarter pause.” With the real fed funds rate just having edged into positive territory, a recession is unlikely -- there’s never been one over the last 50 years with real rates as low as they are now, according to economists including Carl Riccadonna. Not surprisingly, the picture for equity owners brightens significantly when a rate hike turns out to be the last one in a cycle. Exceptions come when a recession follows. In the six months following the last rate hike in a cycle, the S&P 500 has gained an average of 3.6 percent, data compiled by Bloomberg show. Extend that out to a year and the returns more than double to almost 8 percent. 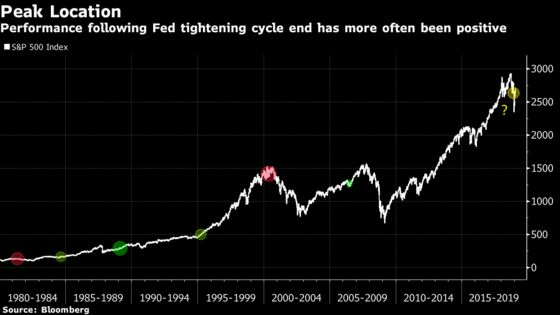 In 2006, the Fed tightened for the last time in June and the benchmark went on to rise 18 percent in the 12 months that followed. Years including 1995 and 1989 also saw double-digit returns following the peak. But in years like 2000 and 1981, when the Fed finished tightening within a year of a recession, returns were more dire. In 2000, the S&P 500 fell near 12 percent in the year following the last rate hike. In 1981 the benchmark dropped more than 15 percent. For Andrew Lapthorne, Societe Generale’s global head of quantitative strategy, the December hike may have been the last, signaling the peak of the tightening cycle and a shakeup in the investing landscape. Typically, that means growth-oriented styles start to see weakness while companies with defensive characteristics like low volatility or quality begin to outperform -- a shift that was apparent at the end of 2018. And while that pattern has largely reversed into the new year, an argument for the bears can still be formed.